U.S. consumers and businesses spent much of the first half of the year disappointed by frequently mixed economic indicators, slow economic growth, lagging employment and, perhaps disproportionately, the debt crisis in the eurozone. 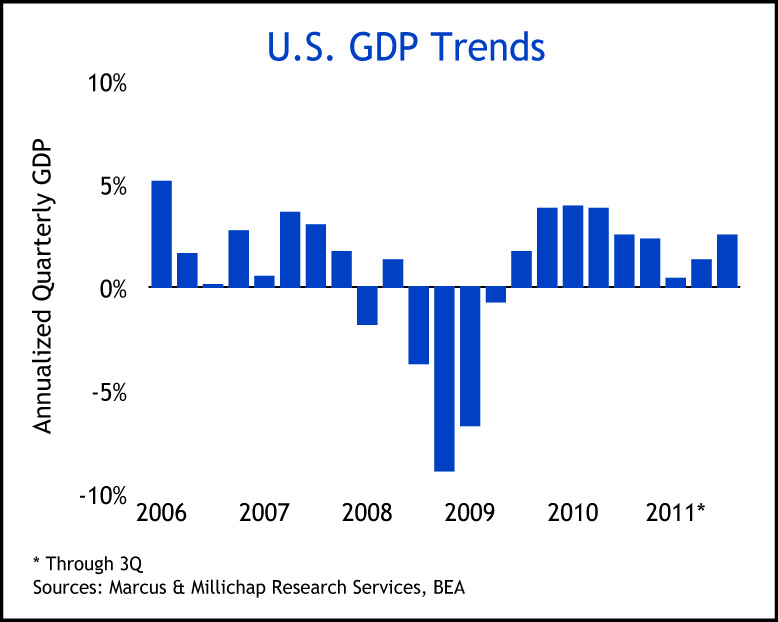 Third quarter GDP data confirmed stronger and more dispersed economic growth than previous estimates. Demand has held up relatively well, notwithstanding a negative bias captured in various measures of consumer and business confidence. The data reflects steady consumer spending and significant investment by a business sector that has contained costs and solidified balance sheets. With yet another strong earnings season behind them and evidence of sustained consumer demand, corporate America may be ready to grow payrolls in a more meaningful way. Finally, welcome news of an agreement on the European financial rescue facility may help allay contagion fears about the debt crisis in Europe, a situation that kept the financial markets highly volatile this year. 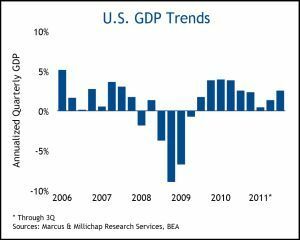 GDP grew 2.5 percent in the third quarter, surpassing the 1.4 percent pace recorded in the second quarter and back on trend with its long-term average. Business investment and spending by consumers and the federal government boosted GDP performance. Total fixed investment expenditures climbed 13.7 percent, broadly supported by double-digit gains in non-residential structures, equipment and software. Similarly, an array of durables, nondurables and services led consumer spending, which marked a 2.4 percent increase. The pullback in commodity prices helped parse true growth from higher prices in consumer spending. State and local government, hurt by revenue losses and dwindling federal aid, continued to restructure local spending and employment, creating a drag on productivity. European leaders agreed to a financial rescue package expanding the European Financial Stability Facility (EFSF). The details of this arrangement remain tentative. The broad-brush elements, however, include expanding the EFSF lending capacity to recapitalize banks, and guaranteeing some proportion of initial losses in the event of bond defaults. Also, the plan establishes an EFSF-funded special purpose vehicle to aid in attracting sovereign capital to eurozone government bonds. Finally, eurozone banks will voluntarily accept a 50 percent write-down in the value of Greek government bonds. Although this resolution offers a welcome sign that Europe may be coming to grips with its debt crisis, many details remain unresolved. As a result, the agreement generated a short-term positive response followed by numerous unanswered questions. With many components of the plan still up-in-the-air and with Greece putting the plan up for Referendum, the long-term implications remain difficult to anticipate. The strengthened GDP figures and a nascent resolution in Europe significantly reduce risks of another recession and will help temper business and investor caution. While these trends offer the potential of broadening economic benefits, numerous headwinds remain. As a result, a slow gradual recovery remains the most probable economic outlook. This should generate sufficient economic activity to generate modest vacancy declines across all four major property types and some effective rent growth, primarily through reductions in concessions. This entry was written by marcusmillichap, posted on November 1, 2011 at 11:53 pm, filed under Research, Uncategorized and tagged CRE, GDP, research. Bookmark the permalink. Follow any comments here with the RSS feed for this post. Trackbacks are closed, but you can post a comment.